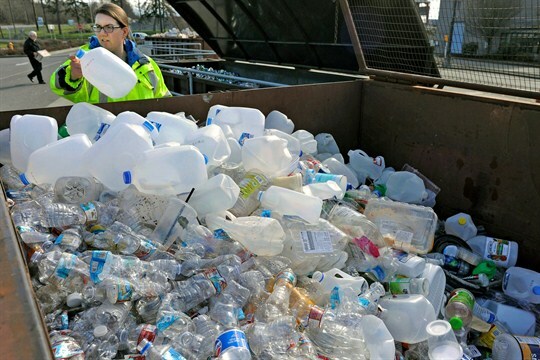 Skagit County Solid Waste Division manager Margo Gillaspy displays some of the recyclable plastic items that had been deposited at the Skagit County Transfer Station in Mt. Vernon, Washington, June 20, 2018 (AP photo by Scott Terrell). Much of the world’s waste used to wind up in China and Southeast Asian countries like Thailand and Vietnam, but in recent years, they have all cracked down on imports of waste and recyclables. This has caused a major disruption in the global waste trade, leading to massive accumulations of plastic, cardboard and electronic waste in developed countries like the United States. According to Derek Kellenberg, an environmental economist at the University of Montana, this may be a turning point that forces the world’s major producers to finally reckon with the true social costs of waste. In an interview with WPR, he discusses what can be done about the under-the-radar crisis in international waste management.